Today we’ll be discussing the musical genre of the Polonaise, which is a Polish dance that appears in a fairly diverse range of piano music. Guys from earlier time periods, like Bach and Beethoven (both German), made use of the Polonaise, but the most famous Polonaises were composed by Frederic Chopin (Polish by birth). Today we’re going to talk about what a polonaise is, it’s history, sound, and characteristics, as well as listen to a few famous examples so you can get a feel for the genre. The polonaise has, as you might have guessed, deep roots in Polish culture. “Polonaise” is actually the French word for “Polish”, and was used as a blanket term for various Polish dances by the French, and other surrounding cultures. Like many other dances, the polonaise started off as a folk dance around the 15th-16th century, and eventually became much more popular as the nobility adopted the dance. It was a couples dance that was stately and slow, consisting of stepping motions. In the early days it was common for a singer to accompany the instruments of the dance, but as the Polonaise became more popular, it became purely instrumental. Because it was no longer sung, the melodies became more complex and decorated in instrumental versions. In the 17th Century, Polish folk dances spread around Europe, and the French grouped them all under the umbrella term “Polonaise”. Of course, there were many different types of Polish dances, but we humans have a tendency to generalize and stereotype. When you’re a part of a culture, you can grasp all the subtleties within it; as an outsider looking in, you just get a general idea. Some of the dances that the Polonaise was born from were dances such as the chodzony (walking dance) and the chmielowy (hops dance). The rhythm of the Polonaise can be wide and diverse, limited only to the composer’s imagination. That being said, Polonaises typically have a common rhythmic thread that links them together. As already mentioned, polonaises are generally at a slow to moderate speed, and the rhythm has a march-like quality to it. They’re always in triple meter (3/4). Dotted figures and consistent patterns of 8th and 16th notes are common. Generally, simple folk tunes will stay closer to an “original rhythm” of a polonaise, while virtuoso composers such as Chopin would have taken many more liberties. German baroque polonaises, like the ones by Bach, have a much lighter tone than later polonaises by Chopin. They demonstrate more of a dance-like quality, even though the genre itself is quite diverse, and one polonaise could sound very different from another. You’ve probably already formed a good idea of what the polonaise sounds like based on what we’ve already talked about. The speed is slow to medium, it’s in triple time, and it’s got a stately, processional character. 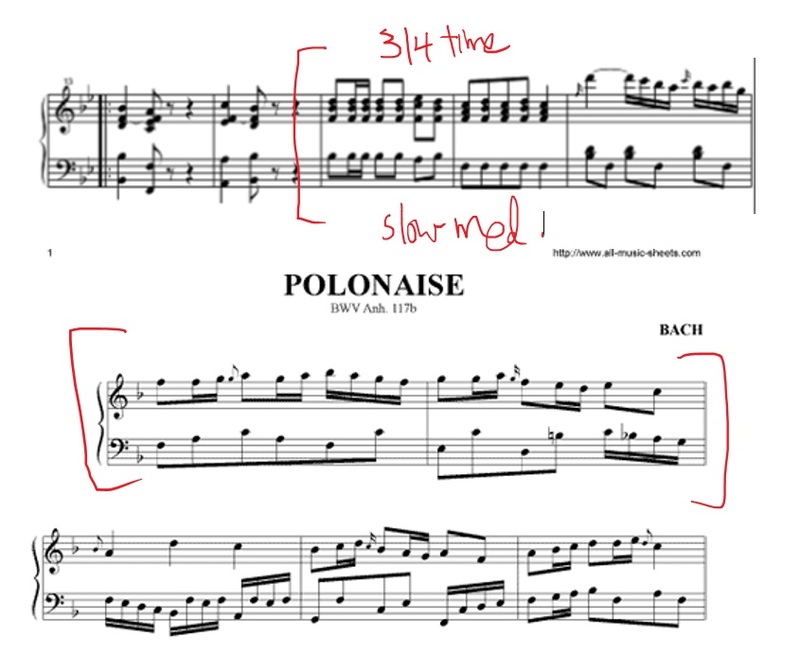 Now let’s listen to three examples of polonaises, which should give you a good idea of the ways in which they’re similar, and the ways in which there can be a great variety of sound from one polonaise to the next. We’ll start with a Baroque example, and then listen to a couple Chopin examples. Starting with the early days of the Polonaise, Germans were some of the first to adopt the dance into their instrumental music. Generally the Polonaise is featured as a movement in a large piece, like a dance suite or sonata. Let’s take a listen to Bach’s Polonaise, from his orchestral suite no. 2 in B minor, BWV 1067. German instrumental has some of the earliest examples of the non-Polish polonaise, and contains its characteristics, which I encourage you to look for – medium-slow speed, 3/4, an emphasis on beat 1, and so on. Since famous German composers like Bach and Telemann started writing Polonaises, they began spreading throughout Europe. With the German polonaises, writing them was akin to exploring a foreign style – even though they still represented Polish folk music, it was from an outsider’s perspective. In the Romantic period, however, native Polish composers began to write Polonaises as well. Of course, the most well-known of these people was Chopin, who cemented the Polonaise as a national icon. I want to take a look at what is probably the best-known Chopin Polonaise – his op. 40, no. 1 (“Military”). To contrast, I want to show you this Polonaise’s twin, the op. 40 no. 2. Rubinstein has commented that the first polonaise, in the key of A major, is a “symbol of Polish glory”, while the second, in the key of C minor, is “the symbol of Polish tragedy”. Both were composed in 1838. Since Chopin was Polish by birth, and since he always felt strongly attached to his homeland (even though he was never able to return as an adult, due to wars and strife), he composed Polonaises as a way to connect to his heritage, but also as a way to make political statements. And this piece wasn’t just a political statement in Chopin’s day – it was also used in 1939 during world war II, played over the Polskie radio as a nationalistic protest. So let’s start by listening to the first one in A major, which is nicknamed “Military” because it conveys Polish victory and triumph. See if you can hear the rhythmic, march-like drive throughout it – and note that even though many of the notes are played quickly, the underlying tempo is moderate. It’s less-famous doppelganger is worth listening to because a) It’s a great tune, and b) it goes to show that Polonaises were a very broad genre – they didn’t necessarily have to sound the same in tone. But even though this polonaise is completely somber in nature, it still shares a common bond with others of its genre – the march-like rhythm, the emphasis on beat 1, and the proud, stately character. In this polonaise, the left hand takes the melody in octaves, which gives us that really depressing, heavy feeling. Piano Solo. Composed by Frederic Chopin (1810-1849). Edited by Ewald Zimmermann. Piano (Harpsichord), 2-hands. Henle Music Folios. Urtext edition-paper bound. Romantic Period. Collection (softcover). With introductory text, performance notes and fingerings. 160 pages. G. Henle #HN217. Published by G. Henle (HL.51480217). The polonaise is a broad genre that Chopin really brought into the open and realized its full potential. I hope this gets you started with the polonaise, and as always, happy piano-ing to you!